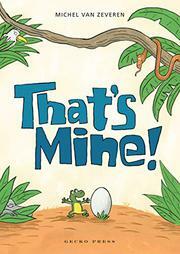 Exactly what’s inside that little egg left unattended in the mighty jungle? A small green frog peeks out from some leaves at a white egg about his own size. “That’s mine!” he declares. A split second later, a long brown snake hisses its way into the picture from above, claiming the egg for himself. Then an eagle flies down with the same assertion. Before he can fly away with the egg, a lizard comes to take it. They fight, and the egg flies through the air. It bounces off the head of an elephant, miraculously not breaking. The elephant reacts with an enormous “Ouch!” When the angry pachyderm turns to ask to whom the egg belongs, each animal passes the buck, the lizard to the eagle to the snake and, finally, back to the little frog. The elephant politely returns the egg, to the chagrin of the others, who leave. Readers may find themselves chagrined, too, at the sudden deflation of tension. What gives? A second later, the egg starts to crack; inside is not a baby frog, but a crocodile. She does look like the frog and rushes towards him with open arms, crying “Mine!” With the exception of the cute little frog, Van Zeveren’s text and pictures are both eminently forgettable.